When they broke open molecules, they found atoms. When they broke open atoms, they found explosions. The Large Hadron Collider is an experiment of gargantuan proportions, 26.7 kilometers in circumference and costing 6.4 billion euros. It’s quest: to find Elementary Particles, that is, particles that are not made of other particles. It is an adventure into the mind-bending world of quantum mechanics. There are two basic types of elementary particles, fermions and bosons. Fermions are the building blocks for all matter, while bosons carry the forces by which these particles interact. 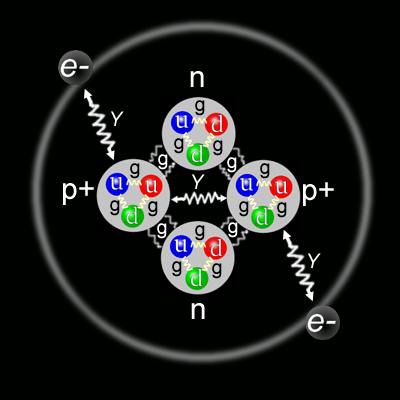 It’s easiest to understand most of these elementary particles by looking at how they come together to form an atom. Atoms are made of protons, neutrons, and electrons. Protons and neutrons form the atom’s nucleus, and they are in turn made up of quarks, a type of fermion. 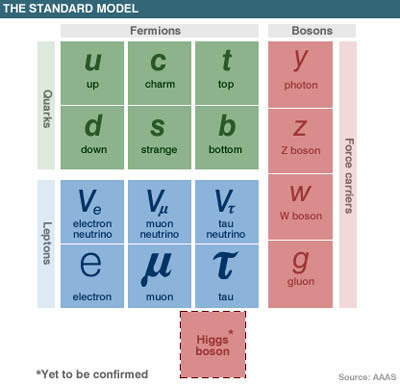 There are six different types of quarks: up, down, charm, strange, top, and bottom. A proton is made of two up quarks and a down quark. A neutron is made of two down quarks and an up quark. Electrons take up residence orbiting the outer shells of atoms, and are themselves elementary, a type of fermion. The bosons hold all of this together, carrying the forces of gravity, electromagnetism, strong nuclear, and weak nuclear. Gravity is why things fall to the ground, and is enforced by gravitons, a type of boson. Electromagnetism is why electrons orbit atomic nuclei, because the electron’s negative charge is attracted to the positive charge held by the protons in the nucleus. The force of electromagnetism is carried by photons. Which raises a question that puzzled physicists for many years. Why don’t the protons within the nucleus of an atom push each other apart? With each carrying a positive charge, the protons are repulsed by one another electromagnetically, like two magnets pushing each other apart. This is where the strong force comes into play. As we mentioned before, protons and neutrons are each made up of three quarks. These quarks are held together by gluons, which carry the strong force. As its name implies says, the strong force is very strong; however, it also has a very short range. When protons and neutrons come together in an atomic nucleus, the quarks within the protons bind with the quarks in the neutrons. These strong force bonds between neutrons and protons are more powerful than the electromagnetic repulsive forces between any protons within the nucleus, and hold the atom together. Here’s a remaining problem, if all of these elementary particles combine to form everything we see in the Universe around us, how do elementary particles, which are massless, combine to form matter, which has mass? 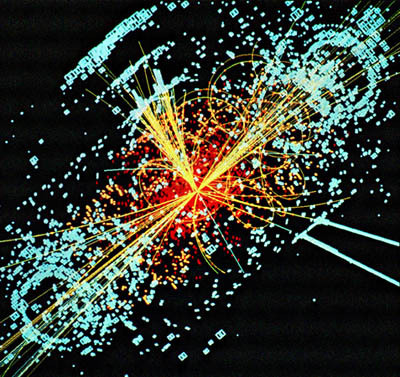 Physicists hypothesize the existence of the Higgs Boson, a particle that, when combined with other particles, gives them mass. Researchers have been searching for experimental proof that this particle exists at FermiLab and CERN laboratories for 10 years now. The Large Hadron Collider, the largest atom-smasher yet, may finally prove this elusive particle’s existence. By some accounts there are more than 293 subatomic particles, many of which are combinations of quarks and gluons. The Large Hadron Collider is nearly guaranteed to discover many more as it smashes atoms together, reproducing the Universe’s environment just after the Big Bang, to momentarily recreate the elementary particles that existed in that brief moment of time. A terrific summary of the Elementary Particles and Forces encapsulated in Quantum Physics, with lots of illustrations and diagrams. Wikipedia’s list of elementary particles.